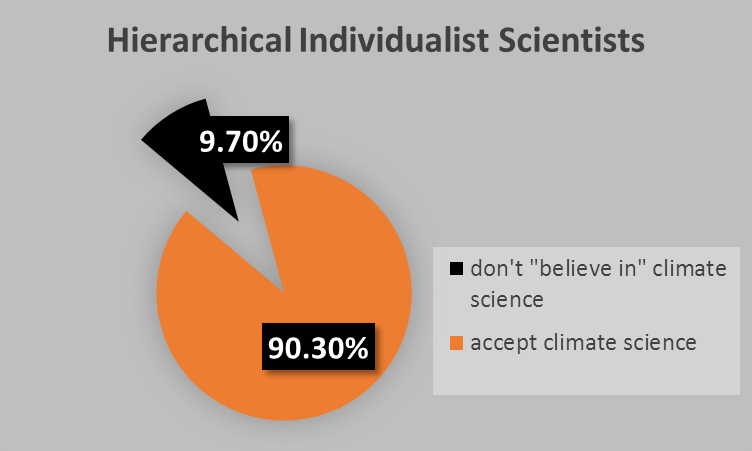 It seems curious to me that if man-made climate change is so certain, why do some people feel the need to prove that a majority of their peers believe in it and that anyone who doesn’t is simply wrong? Why would Anthony find this curious. After all, he and his followers don't believe scientific facts. And a lot of Americans and Australians don't believe scientific facts. So why shouldn't the people who understand and accept the facts want to let more people know that humans are causing climate change. It's damn dangerous. Responsible people want to protect their fellow human beings. Yes, including deniers and those of little brain. Remember too, this is from Anthony Watts, who knows next to nowt about science of any kind. Certainly not climate science. He's not too hot on geography either. I'd say he no longer "believes" in the greenhouse effect. The evidence is the number of articles he posts that deny it. And he does his utmost to get people to "believe" in the various weird and wacky and downright nasty conspiracy theories he posts on a daily basis. 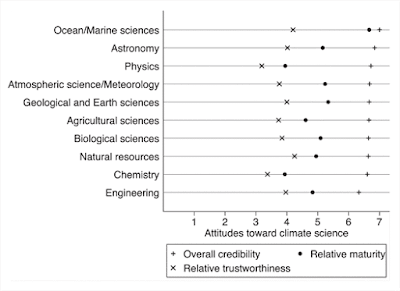 scientists who are publicly skeptical, most of whom are not climate scientists. In this study, we examine scientists' beliefs about climate change and climate science to determine (1) whether or not scientists agree with the climate science consensus about climate change and (2) whether cognitive factors and trust in climate science influence scientists' beliefs. The authors surveyed scientists from a range of biophysical science disciplines in the Big 10 Conference. That is, from 12 large, research-oriented universities in the United States: Indiana University, Michigan State University, Northwestern University, Ohio State University, Pennsylvania State University, Purdue University, University of Illinois, University of Iowa, University of Michigan, University of Minnesota, University of Nebraska, and University of Wisconsin. Taken altogether, 91.9% of respondents agreed that humans are causing global warming. Not quite as big a proportion as experts in climate science but it's an overwhelming majority. What would be interesting would be to compare the broad scientific thinking on climate science with that of other scientific issues, like Higgs Boson, or evolution, or the efficacy of vaccinations. There's more. Most respondents agreed that climate science is mature, and that it's as reliable as their own discipline. What about continental drift - er, plate tectonics? Now as you know, Anthony Watts knows next to nothing about science, and most of what he thinks he knows is wrong. For example, deniers often call on Alfred Wegener, who realised that the continents once fitted together. He didn't quite get how it all worked, but he did come up with the germ of an idea. His ideas weren't accepted immediately, mainly because he couldn't figure out how the continents moved apart. He thought the continents might have move through the Earth's crust. Perhaps the hostile scientists should have been more open to Wegener's ideas. However scientists are sceptical by nature and it takes a lot of evidence to persuade them of new ideas. Wegener also made some mistakes along the way, which didn't help. Some scientists were supportive, but quite a few were not. It wasn't until the ocean floor was explored in the 1950s that the real mechanism (tectonic plates) was identified. So it turns out that Alfred Wegener got some things wrong and some things right. Climate science is strongly supported by multiple lines of strong evidence. "Continental drift" was just a speculative hypothesis which turned out to be mostly wrong. 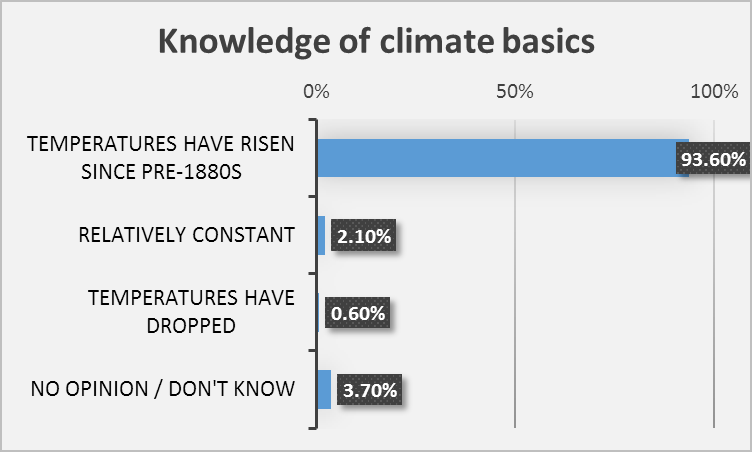 Virtually all scientific experts agree with the main findings of climate science. That's because their findings all support the same basic theories. Very few geologists agreed with the notion of "continental drift". That's because there was a lot of evidence that conflicted with the notion - such as the fact that if continents moved through the Earth's crust, it would become grossly distorted. And there was no evidence of the massive distortion that would occur. In the end, when evidence of tectonic plates emerged, then scientists were able to accept Wegener's view that continents once fitted together. Two things happened. There was a plausible mechanism plus ample evidence to support it. Only then was a theory able to be accepted. Anthony talked about continental drift. I wonder if he knows that continents don't "drift" through the Earth's crust. Or perhaps he doesn't know that Alfred Wegener's hypothesis wasn't the same as plate tectonics. Don't get me wrong. Unlike Anthony Watts, Alfred Wegener was a brilliant man. He came up with a brilliant idea. His main problem was that there wasn't the technology around when he was alive that would have allowed him to figure out how the continents did move. What "new information" would that be? Sound familiar? The point here is that a perceived consensus doesn’t necessarily indicate factual certainty for any idea, and consensus in science can be overturned easily with new information. He's wrong about it being easy to overturn consensus. You need strong evidence to overturn a scientific theory. As they say, extraordinary claims require extraordinary evidence. In any case, there's no new information to overturn the greenhouse effect. And the evidence of it is there, everywhere in space and time. Going way back - millions and millions and millions of years. What "new information" does Anthony think will change the course of physics, chemistry, biology, geology and all the other disciplines that contribute to the understanding of what causes climate? The point is, that disinformers like Anthony Watts don't need evidence. They have it easy. There are plenty of people who don't want to accept facts. All they want is doubt. That's enough. When there's no doubt, they are happy to pretend there might be some doubt in the future. Hence Anthony's comment. Informed people on the other hand, investigate. That's what this new research shows. And the more they investigate the more they accept the science. These are scientists themselves. This isn't a bunch of motivated disinformers who, for ideological reasons, want the world to get hotter. These are professionals in other scientific disciplines. Educated, clever people quite unlike the dismal dismissives who flock to conspiracy blogs like WUWT. Below is Figure 4 from the paper, showing how respondents view climate science. Figure 4. 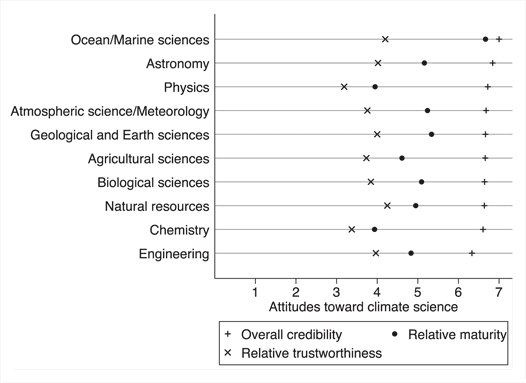 Big 10 scientists' perceptions of climate science as measured by overall credibility of climate science, the maturity of climate science relative to respondents' field, and the trustworthiness of climate science relative to respondents' field. Relative trustworthiness was re-scaled from 5-points to 7-points for this figure. 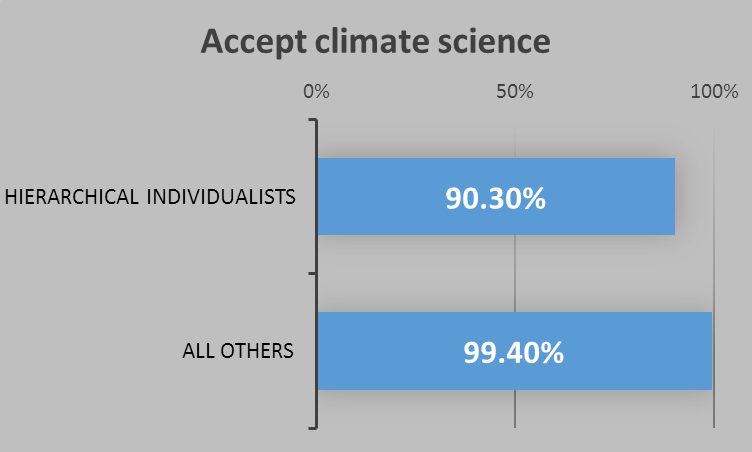 Climate science is credible: There was almost unanimous agreement across all disciplines surveyed that climate science is credible, with a score of 6.67 out of 7. Climate science is a relatively mature science: Overall there was agreement that climate science is a mature science compared with their own field. That is, on par with most fields. Even those in the oldest, arguably most mature fields, physics and chemistry, did not on balance think that climate science was immature compared to physics and chemistry. Climate science is almost as trustworthy as their own field: Overall, scientists viewed climate science as almost as trustworthy as their own field, with an aggregate result of 2.69 on a scale of 1 to 5, where 1= Much less trustworthy, 3 = About equally trustworthy and 5 = Much more trustworthy. Allowing for allegiances, I'd regard this as a ringing endorsement of climate science. If you look at Figure 4 above you can see that Anthony Watts loses out when he compares climate science to geology. Geologists themselves regard climate science as highly credible, mature relative to geology and as trustworthy as geology. 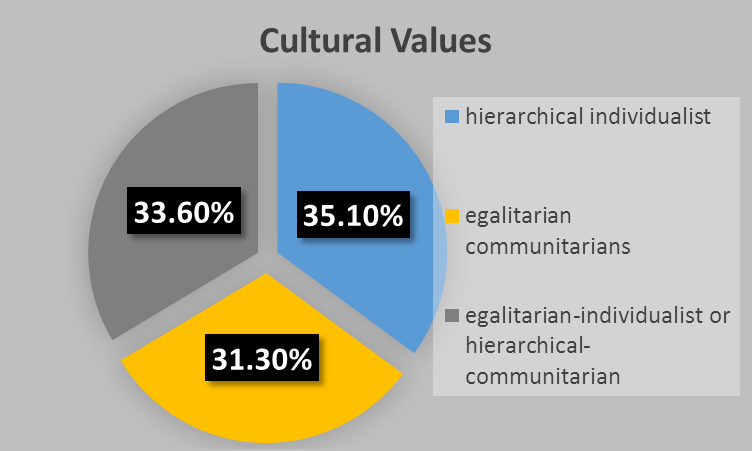 A significantly smaller proportion of hierarchical individualists (e.g., those who scored above the median on both the hierarchical and individualism scales, Kahan et al 2011) believed in climate change than non-hierarchical individualists (94.3% versus 98.8%; t = 2.11, p = 0.02). If that doesn't convince you of how far from reality is WUWT, then I don't know what will. That's a complete contrast to readers at WUWT, where more than 98% of them let their cultural values or other cognitive obstructions over-ride their intellect. This survey got the attention of WUWT readers. It woke them from the slumber they've been under and generated a minor flood of thoughts - 223 of them at the time I last archived the web page, and several more since then. Here is a sample. Mike Campbell was first to comment. He couldn't be bothered reading the open access paper and went straight for the logical fallacy of personal incredulity. This is Telltale Technique No. 2 of climate science denial. I just wonder how they select the respondents for the survey. I simply can’t believe that there actually is this much consensus out there. Ben Of Houston was upset that the survey didn't include engineers. He wanted a different survey. One of non-scientists. Why he picked engineers and not historians, or economists, or plumbers and electricians I don't know. In any case, the survey caught a small number of engineers who work in science departments. Please note the discipline that is missing from the survey, engineering. Even as far back as my college days, my engineering professors were outright dismissive of the global warming scare. A lot of the consensus appears to be due to professional courtesy, but most importantly is the deliberate obfuscation of the question. Please note the statements: “temperature has risen and man is responsible”. This is a very broad strokes question that most respondents here would agree to. Of course, many would argue that it is due primarily to deforestation and land use changes, or simply state that the dangers of the expected warming have been greatly exagerrated. The most important part of the survey is the question. Jeff Mitchell also wanted a different survey. He should know that the people who are experts in the field have been the subject of numerous surveys - and at least 97% of these experts agree that humans are causing global warming. Jeff's a political denier. My first thought was “why are they asking the opinions of people who are not experts in the field?” These people got their information from other sources. They did not work it out for themselves. Such a survey tells us nothing of use. The respondents are merely parroting what they see in the press, which is overwhelmingly left on the political spectrum. The agenda isn’t science, it is control, which is a political beast. A beast we should be very concerned about. 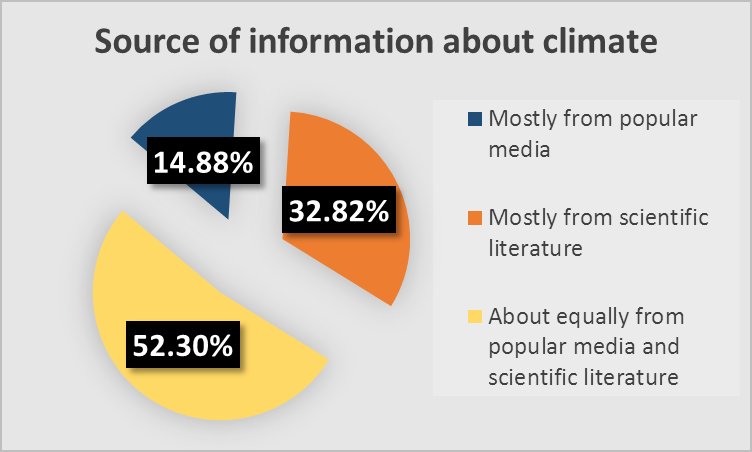 You won't be surprised to find out that the researchers found that people who got more of their information from mass media than from scientific literature were slightly less certain of the existence of and human contribution to climate change. Don G said he would have asked just two questions. His questions were almost identical to two of the questions that the researchers did ask. I'd say Don G didn't bother reading the paper either before this comment, though in a follow up comment he showed that he did get around to it eventually. 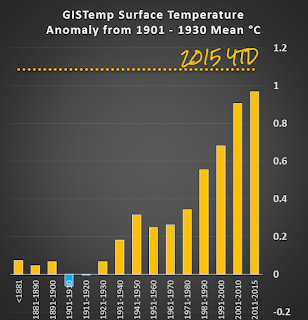 1) have average global temperatures risen/remained/fallen since the peak of the last ice age? 2) is the change (if any) primarily caused by human emissions of GHGs? dbstealey goes for conspiracy. "Something must be wrong" and "nefarious intent" being two hallmarks of conspiracy ideation. 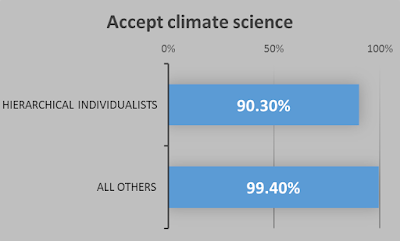 That means ≈half of the respondents have a vested interest in promoting climate alarmism. They are being paid to sound a false alarm. And surely they must know it, too; they’re not stupid. So from the get-go they’re not very honest. Pushing a poll in the direction that helps secure their income stream is a no-brainer for the ethics challenged. And who is going to pay someone who correctly points out that nothing currently happening is either unusual or unprecedented, and that prior to the industrial revolution global T changed much more than it has over the past century? Anyone who tells the unvarnished truth will just have to forget about those easy money grants. So the situation is this: taxpayers’ money is being given to those who sound the false alarm. The goal is passage of a carbon tax, therefore taxpayers are being forced to fund a hoax that will result in much more of their money growing an already out of control bureaucracy. It will be heaven for EPA bureaucrats; but hell for the rest of us. 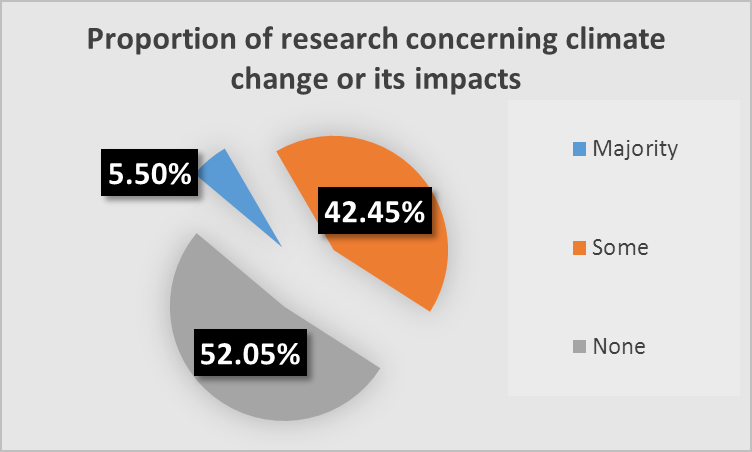 What he was referring to was the proportion of respondents who have engaged in research relating to climate. 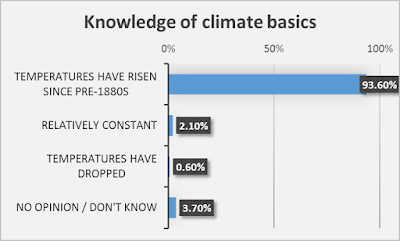 Since more than half the respondents didn't do any work relating to climate, and only 5.5% worked mostly on climate-related research, how does dbstealey account for the fact that more than 90% of all respondents, including the 52% who don't do any climate-related research, agree that humans have made a significant contribution to mean global temperatures? MarkW is one of a number of WUWT-ers who are concerned that the survey is biased by knowledgeable people! How appalling. P'raps the researchers should have asked the illiterati at WUWT what they think. Beyond that, this survey is being sold as the “opinions” of non-climate scientists. 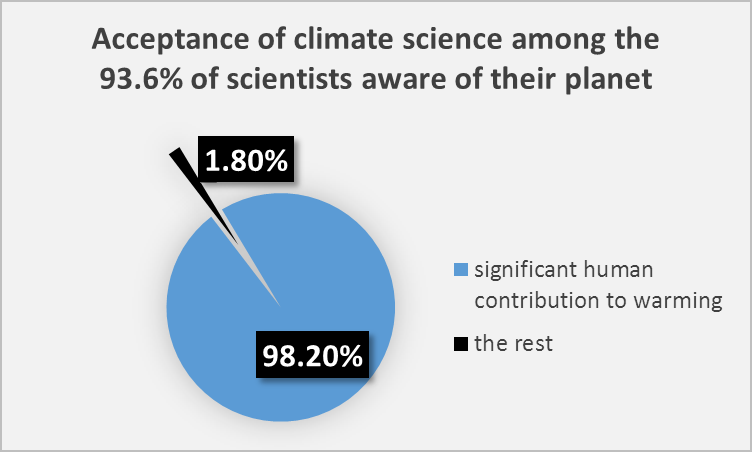 Yet half of those who responded work on climate science. The very basis on which this survey is based has been invalidated. JimS doesn't care what scientists think. He has a point, to a point. However scientists themselves rely on consensus. Knowledge is built on increasingly strong foundations. Scientists don't go back to first principles with every experiment. They assume, for example, that molecules are made of atoms. That water turns to ice at certain temperature and pressure. That most plants need light, water and nutrients to survive and grow. They don't go back and retest basic scientific ideas every time they do a bit of research. They rely on consensus until and unless new evidence causes them to rethink or adjust a theory. Consensus is a political measuring device, not a scientific one. So why are people so obsessed with applying it to science? willhaas reckons that counting poles (or fence posts) won't tell you much about climate :) Who cares what scientists think? Willhaas doesn't "believe" in science, and that's all that matters - to her or him anyway. Scientists never registered and voted on the matter. Science is not a democracy. Scientific theories are not validated through opinion poles. The laws of science are not some sort of legislation. The whole thing is rather foolish . It is politics and not science. The AGW conjecture is full of errors and no opinion pole is going to make up for them. The reality is that there is no real evidence that CO2 has any effect on climate. Peter Ward is confused. He's heard that the opinion of non-experts who don't accept science is worthless, and he can't figure out why it's interesting to see that tiny minority in perspective. To find out that they are only a very small minority. Clear thinking is not an attribute one associates with science deniers. Previously we’ve been told to ignore the opinions of non-“climate scientists” because they aren’t “climate scientists”. What’s suddenly changed? actually was: ignore the opinions of non-“climate scientists” [when they disagree with AGW] because they aren’t “climate scientists” [who agree with wealth redistribution]. So, What’s suddenly changed? Nothing has changed. They are largely citing those who believe in the AGW religion. 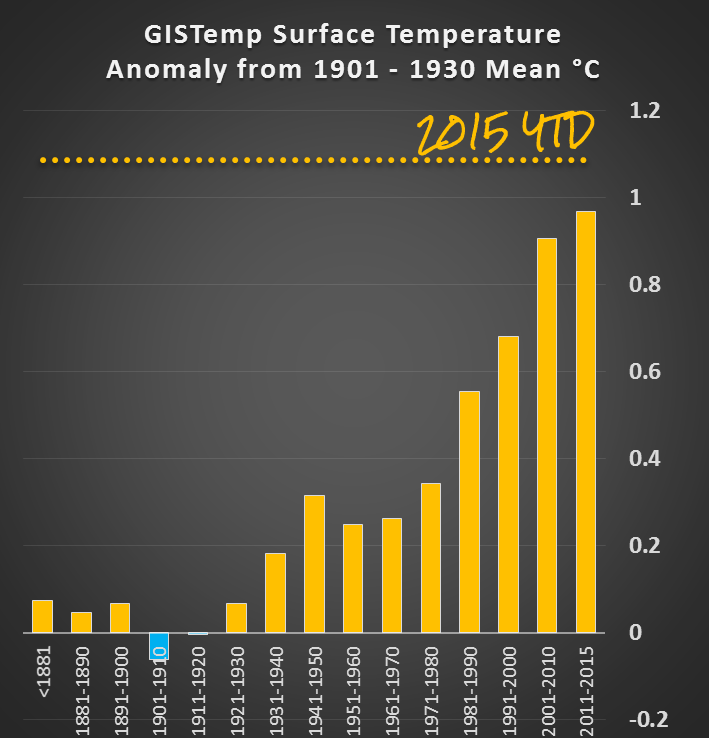 herkimer claims that most people agree that global temperatures have risen. I reckon he'd be suprised if he asked WUWT-ers whether they agreed with that or not. Anyway, what he or she doesn't comment on is the 98.2% of respondents who also agree, who know that humans have significantly contributed to the global mean temperature. You'd think that odd if you weren't familiar with that species of denier who congregates at WUWT. This statement has never been contested by most if not all skeptics . The disagreement is over the claim that man is primarily responsible for this back ground warming of about 0.75 C per century. There are a lot more comments where those came from. One thing is clear. WUWT conspiracy theorists and deniers are a tad upset that almost all the scientists who responded accept climate science. Some might realise deniers are fringe-dwellers, but most probably still don't accept that. Hanging about with other like-minded conspiracy theorists on the fringes of cyberspace helps them hang onto their delusions. I wish dbstealey would tell us all where to apply for the money we can get just for doing nothing more than accepting the science supported by every single prestigious scientific body on the planet. On the other hand, where to go - if like dbstealey you want to deny (oh sorry, doubt) climate science - is a matter of public record. I'm an academic scientist myself, though not a climate scientist. I think it's actually pretty unlikely that each of the scientists surveyed here has thoroughly researched the matter and "bit the coin" to verify that it's right. However, practicing scientists have scientific "meta-literacy". We know lots of other scientists, we've been soaking in the culture for many years, and we know how scientists think; we know their ethos, and their motivations, because they are the same as ours. Most of us have also seen the funding mechanisms from the inside because we frequently serve on agency review panels (some of us even rotate through as temporary program officers for funding agencies). All of us referee papers. This experience inoculates us against the ridiculous smears that climate scientists are all greenie leftists whoring for grants from a corrupt government, and that referees only pass papers written by their ideological compatriots. With this meta-literacy, and a modicum of familiarity with the subject, it becomes blindingly obvious that the propagandists have only disingenuous factoids and murky conspiracy theories to support their position, but all those folks over in earth sciences are doing normal science and piling up mountains of persuasive evidence. My experience exactly. I suspect a very, very large large fraction of scientists read "meta-literature" such as Science Magazine (AAAS) and Nature where every discipline of science is discussed in a cross-disciplinary manner. The journals also provide a cross-discipline venue for original publication of ground breaking research (quantum mechanics of graphene in interstellar space found next to dsRNA found in mouse brains). Science Mag is my favorite and has been for over 45 years. Even though I have little understanding of biomedical/genetic acronyms used in the basic research articles, I can at least rely upon the weekly summary articles to provide the perspective and context from the experts. I find this true even in my own fields of expertise. It has never let me down. Your last sentence rings so true. My experience in and with academia, industry and neighbors over the decades suggests that there exist a small, but annoyingly significant percentage of people (across all disciplines) who are fundamentally incapable of "getting it" and never will, much as there is a percentage of people who are crippled and incapable of "walking" without a crutch. Perhaps a solution to the "getting it" problem is not so much arguing logic and facts, but finding that "crutch" to "getting it". Is such a "crutch" possible? What would it be? An academic scientist might share in all sorts of rightwing lunacies, such as trickle-down economics, but they're not going to buy the caricature of professional science believed in by Tea Partiers. Some emeriti apart, of course. Re. Comment cited above: I would be curious about engineers myself. But probably only to confirm my own, possibly arrogant, prejudices about scientific understanding in that group. jglfld -- I'm not an engineer myself, but my impression is that they run the gamut from excellent scientists to somewhat bone-headed specialists who are sure that their engineering training makes them far superior to all those scientists. The vast majority of engineers are not cranks, but an alarmingly large fraction of physics cranks are retired engineers. 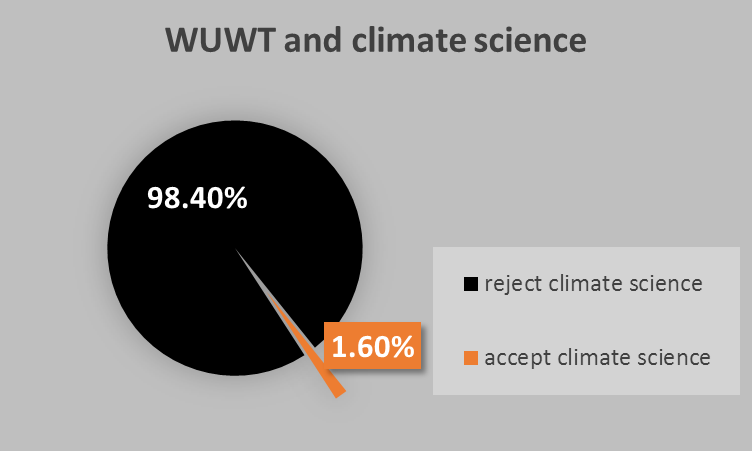 I know from WUWT that of all technical/scientific disciplines, there are more engineers who frequent WUWT as deniers than from any other field. However that doesn't mean that the converse is true. That there is a sizeable proportion of engineers who reject science. I'd say there are more engineers than research scientists in any single discipline. Same with evolution - but again, I doubt that this means that most engineers reject biological science. Does anyone know of any studies of engineers' opinions about any particular scientific fact like climate or evolution? And is it region-specific - like being restricted to USA and Australia, and maybe Canada? All true...that is why it might have been interesting to include them in the pool. Just to see. Sadly, I have a pretty extreme engineer--in terms of accepting science--in my immediate family. So that probably clouds my own thinking. It would be helpful if those that designate themselves as engineers would mention which branch. Some branches seem a little closer to science than others. COI: my sister in law is a electrical and design engineer in the USA. I'm the proud possessor of one of the UK's first electronic engineering degrees. They taught us quantum physics, amongst other things. A "pretty extreme engineer" indeed! Now what does that prove? Nice that "they taught [you] quantum physics". Do you think that all readers of novels are able to write world class literature? Engineers can do wonderful things. I got my PhD in electrical engineering and have deep respect for the instruments they were able to build and thankful that I was allowed to use them. But when it comes to science, classical engineers are users, not producers. Victor - No I don't. I suppose I could have had 2 PhDs, but somehow I never got around to writing up either of them. I assume your point is that many engineers don't (even try to?) understand climate science? That certainly seems to apply in my current area of "expertise", which by some strange quirk of fate happens to be electricity distribution. Jim Hunt, no that was not my point. As already mentioned above most engineers are normal people. The problem is just the political radicals at WUWT, who for some reason people try to understand are quite often retired engineers. They do not give the impression that they try to understand climate science. That may make sense, because otherwise they would not be able to stomach WUWT, others being intelligent enough not to be fooled. My point was that being a user of science (engineer), does not mean that you are also a good producer of science (scientist), nor that you necessarily know how sciences works. They are related fields and some engineers also have these abilities, just like some scientists build or design their own instruments, but not any engineer will be good at science. I know that "Quantum physics != Classical physics". I studied physics. Quantum engineers != Classical engineers? The problem with quantum mechanics, of course, is that they have to be able to get their fingers around those tiny, tiny little wrenches. Re. continental drift...while in a different field, I came in at the tail end of the revolution. High school/early college learned about "land bridges" which rose and fell a lot, for example. Plate tectonics was resisted as it came in by some. I seem to remember some UChicago geophysicists being particularly vociferous. But mostly I remember the general feeling of wonder as the pieces came together. The resistance was on evidentiary grounds and the suffiency of it rather than anyone at all committing "hoaxes". Conspiracy theorists simply do not understand that sort of thinking. It is beyond their ken. Or perhaps beyond their personality type. Acceptance of plate tectonics is now the consensus position. I wonder if for WUWT-ers that means it must be wrong? The continental drift hypothesis proposed by Wegener and several others in the 1920s and 1930s was not uniformly rejected. Based on geology (matching stratigraphy across ocean basins), geography (the fit of Africa and South America) and biology (similar fossil assemblages found on widely spaced continents), it received a respectful hearing and some level of support from geologists in European and the southern hemisphere. However it failed to advance further due to the then-lack of a viable physical mechanism and observations showing seafloor spreading and subduction. Something that will be wearily familiar to anyone following the global warming discussion of the past 30 years is that continental drift was most widely derided by American geologists working in the young oil industry. geologists in 'Europe'. Missed that in proofreading. "What "new information" does Anthony think will change the course of physics, chemistry, biology, geology and all the other disciplines that contribute to the understanding of what causes climate?" The next ice age ... which is starting any day now! PS I'm an engineer (chemical), and I think part of the problem is that engineers are often one step removed from basic science. Engineers, in their daily work rely on heuristics, often using equations, charts etc. created by others. They don't need to remember any of the basic principles. As demonstrated recently in comments for an earlier blog post, a chemical engineer doesn't _need_ to understand the basics of radiative heat transfer (although they should!). I'm sure Sou has pointed this out before, but how long has Anthony Watts been coasting with the lazy tactic of copying and pasting full science news releases or paper abstracts and putting a snarky sentence or headline in front of them? I don't think its lazyness. I think Anthony wishes with all his heart that he could write page after page of wisdom to be gobbled up by the flying monkeys. But he has found to his cost that the less he writes the fewer times he ends up looking stupid. Millicent: "But [Watts] has found to his cost that the less he writes the fewer times he ends up looking stupid." It doesn't help that a certain personage has the habit of spotting and highlighting every instance of stupidity that Anthony engages in. It is very telling that he refers to Sou as his 'stalker': an indication of how hard her work has hit him. And that is one more revelation that a wiser man would have kept to himself. It's entirely too easy to follow engineering recipes (that don't apply) without thinking, or worse yet to assume that naive intuition regarding something outside your field is a solid recipe - and assert some vast and unsupported certainty about that naive intuition. And so we see attempts to map all of the climate into simplistic electronic designs, Just So stories about thermodynamics, "Notch filters" of insolation, etc. And what we see on the various denial sites are engineers outside their fields, who make the most rudimentary of errors, locking onto those as if they were the revealed wisdom of the gods - and in general being both rather unpleasantly arrogant and inflexible about it. Because they don't question their recipes, and neither do they question their uninformed and erroneous intuitions about things that aren't in the engineering playbooks. As an aside: Much of the geophysical work that led to the plate tectonics revolution was done by the US Navy mapping the sea floor for submarine warfare. The US Navy today is concerned about climate change, in part because of rising sea levels, which matters to them for some reason or another. My first thought was 'why are they asking the opinions of people who are not experts in the field?' These people got their information from other sources. They did not work it out for themselves. " Shouldn't Jeff (et al.) be a bit introspective since that's exactly what he and the population at WUWT are all about? Unfortunately, the WUWTers get their information from a single source with a narrow, self-limiting perspective. At least "these people" get their information from other sources (pural) so have a broader (albeit incomplete) perspective. I gotta' be insane to keep reading stuff like this! Denier "logic": The fact that scientists across the board accept the results of climate research simply shows how incredibly vast the international conspiracy of scientists committed to the "hoax" really is! Electrical engineer here myself. We did get a smattering of Newtonian physics, and a *lot* of solid state physics, but yeah, scientists we're not. ...The reality is that there is no real evidence that CO2 has any effect on climate. I have no words that could adequately express how I feel about that statement. Not ones that I would (consciously) use in public, anyway. ...The disagreement is over the claim that man is primarily responsible for this back ground warming of about 0.75 C per century. So, let me get this straight. You think that an increase in mean temps of 0.75C *per century* constitutes "back ground warming"?! Alright then, leaving aside the fact that this rate of change is probably unprecedented for millions of years, what do you think is causing this "back ground warming"? Because if it's happening all by itself, we just might be in a lot of trouble. To borrow a turn of phrase from tamino: dumber than a bag of hammers, this lot are. 0.75°C/century * 6000 years * 100 years/century = 45°C. Paradise must have been quite cold. Not a place to run around naked. I have no words that could adequately express how I feel about that statement. Not ones that I would (consciously) use in public, anyway." We see the same rejection of evidence with creationists, unsurprisingly. Richard Dawkins interviewed Wendy Wright, a Christian conservative political activist, a while back. She kept asking him "where is the evidence" for evolution. When he patiently cited what we would regard as irrefutable evidence, she kept waving it off and asking "where is the evidence" again. She even managed to embarrass other Christian conservatives. A clear motivation for science-denial is religious faith: "If thou canst believe, all things are possible to him that believeth." (Mark 9:23). if science is a way of trying not to fool yourself, then faith is a way of allowing yourself to be fooled. I am not sure but I think the clear motivation is not so much "religious faith" but the espousal of a particular fundamentalist type of American-originated religiosity. I have read that the Church of England in the 19th century did not seem to have any serious issues with Darwin although there may have been one or two bishops who were offended. I don't recall hearing anything one way or another from some of the more respectable commentators in Islam or Hinduism. Yep. When I hear 6000 years, I think of America. Fortunately just a part of it. Every denier I know personally is a programmer or computer scientist. Almost every programmer and computer scientist I know thinks deniers are nutty. As does every engineer I know, and every scientist I know. Most the other people I know don't even realize there's a "controversy". The most vehement deniers I've met (outside of Kramm and Akasofu) are the mineral prospectors who did their PHD or MS on resource extraction. I guess that goes with the territory and choice of profession. In my experience its a love of motor cars and Jeremy Clarkson that serves as a good predictor of denialism. In my observation it's conservative/right-wing politics and ideology that's the key correlation, in scientists, engineers and others. For reasons too long and argued over to get into, scientists tend to have a liberal/centrist/left-wing lean. Frankly, I don't know of any good predictor other than libertarian ideology. All others IME, it's the thing about how all monarchs are human, but almost no humans are monarchs. Sure, most the deniers I know love cars, but most car-lovers think deniers are loony. As Stephen Colbert said, "Reality has a well known liberal bias." Orac in the Respectful Insolence blog has some interesting comments on doctors are not scientists and compares them to engineers. Both professions are users of science not typically scientists. Medical training is not the same as scientific training. Yes, science is a prominent part of medical training, but not in the same way it is for scientists. In actuality, although medicine is based in science, it is an applied science. The vast majority of physicians do not do scientific investigation or contribute to scientific knowledge. Rather, they apply known science to the treatment of patients. This is not a knock on them, or an insult, or a criticism. It is simply an acknowledgement of what most medicine is. Medical school is very much more like a trade school, in which students are taught how to take care of patients, than a school teaching how to do science. Basically, medicine as a profession resembles engineering far more than a scientific specialty in that the vast majority of physicians apply science to the problem of diagnosing and treating illness, as engineers apply science to the problem of building things. Again, this is not a knock on either physicians or engineers. How they apply existing science to solve problems (or, in the case of engineers, to build things) can involve incredibly clever feats of mental prowess, but it is nonetheless a very different process than doing science to produce new scientific knowledge. Scientists are the outliers, at least in terms of the way most are expected to work within their professional careers. This seems to be rooted deep in human nature. For most cultures past and present questioning why things are the way they are is often discouraged soon after children learn to talk.